How to recover more fluids from the used drilling mud? All driller are thinking about this question all the time. Now GN released the ViST vacuum shaker screen system that can help to recover more drilling fluids with high efficiency. As the name implies, the ViST vacuum shaker screen system is including a ViST vacuum unit connecting with a collecting pan that is installed under the last panel shaker screen at the solids discharge port. The pan is like a hopper with an opening at the bottom where connect to the vacuum unit via a hose. When the drilling cuttings pass through the last panel screen, the remaining large quantity fluids on the cutting would be sucked and get through the shaker screen mesh to the pan then to the vacuum unit. At the vacuum unit, the discharge port is connected to a storage tank, the recovered fluids will finally be transferred to the tank. 1. The Vist vacuum shaker screen system is suitable for OBM, WBM and SBM. 2. Recovered drilling fluids increased by 30%~50%, greatly reduces the discharge of drilling fluids. Per the drilling speed, the recovered drilling fluid is around 3 cubic meters per day. And the cost in transporting the waste will be greatly reduced. 3. Saving the cost in placing a High G force drying shaker on site, as the ViST vacuum shaker screen can make the discharged cuttings much dryer. The installation design will not need any extra area onsite. 4. By using the ViST vacuum shaker screen system, the mud engineer can put finer screen on the shaker which and separate the much finer cuttings. GN is only able to provide the ViST vacuum shaker screen system to fit on GN won shale shaker, but also on clients’ existing shale shaker. 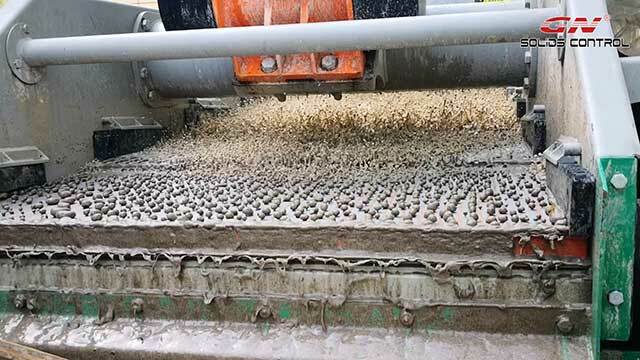 The ViST vacuum shaker screen is an ideal device for recovering more drilling fluids and reducing the waste discharge. It can bring great financial benefit to clients. For more information, please feel free to contact with GN.